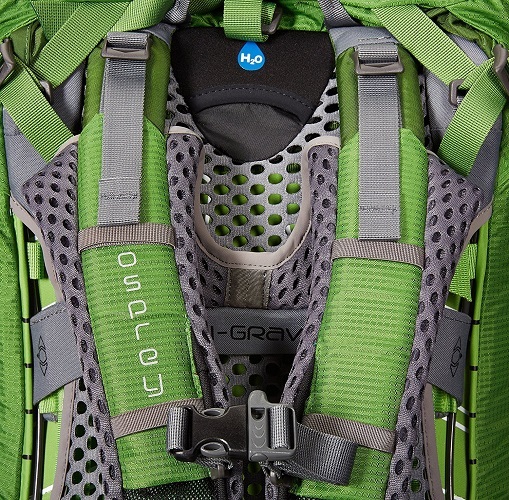 This is the Atmos 65 AG hiking backpack by Osprey. Osprey has been around since the mid 70’s and they are a force to recon with in the field of backpacks, whether it be for hiking, traveling or just a normal daypack. Osprey packs are perhaps the best on the market for their costs and are some of the best-selling packs out there and there’s good reason for that. This Osprey Atmos 65 liter backpack blew our hats off in a number of areas we were not expecting, looking at you comfortability. 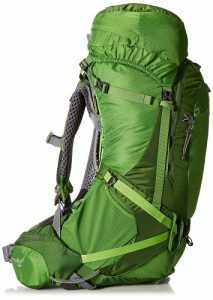 We review the style, comfortability, durability and functionality of the pack to give you an overall idea of how each section fairs and then an overall rating. If you’re looking to do a week camping trip or a couple months backpacking through the mountains this is the pack for you! The Osprey Atmos 65 liter hiking backpack is a large backpack even for a 65 liter backpack. It’s got decent style for a hiking backpack and although it’s got a lot of size to it, the lines on it at least make it look sleek and flow very well. This hiking backpack by Osprey is offered in a few of Osprey’s commonly used colors. You can select between Cinnabar Red, Absinthe Green or my personal favorite, Graphite Grey. All of these backpacks are made of a durable nylon that stands up well against the elements. Osprey only uses top of the line, high quality materials that are durable and it’s quite noticeable even compared to some of the older models of Ospreys. You can clearly see they are always improving on their design and quality. As you can see each size has a little variance in it. Obviously the smaller pack is a bit shorter, lighter in weight and holds just a little less overall, whereas the larger pack is a bit bigger, heavier and holds more than the advertised 65 liters. You shouldn’t really dwell on these small minor details as it’s more important to pick the size based on how it fits you and how comfortable you can be while hiking with this backpack. This nicely leads us into our next category regarding comfortability. 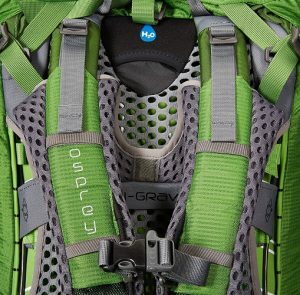 Before we touch on the comfortability of the Atmos 65 AG let’s recap the style that Osprey has displayed with one of its premier hiking backpacks. The Atmos features high quality, top of the line materials to construct the backpack. They have also offered it in three sizes along with three colors as well. While I like the options in sizes, I would like to see a couple more color options but it doesn’t warrant a lower rating. 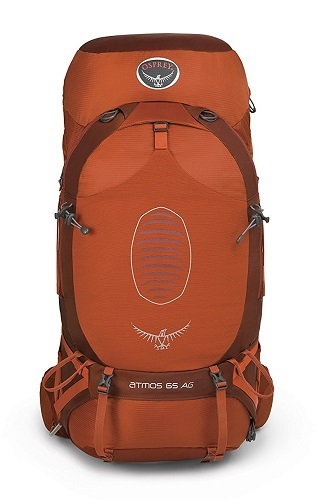 Overall the Osprey Atmos 65 gets 5 out of 5 stars for style and design! Osprey is often known for their backpacks that look great and last you a lifetime and while that may be true, they are also extremely comfortable. The Osprey Atmos 65 AG really takes the AG(Anti-Gravity) part to hear and it’s incredible how well made and comfortable it is to hike with this backpack on. The anti-gravity version of the Atmos 65 is a thing of beauty. It really is perhaps the most comfortable design for a backpack where you don’t have to adjust every little thing to get it perfect, although you can do that as well with the adjustable harness. This allows you to adjust the torso length so if you’re doing the Pacific Crest Trail or AT, you won’t ever have to worry about discomfort. Of course what would a hiking backpack be if it didn’t also allow you to adjust the hip belt pads that come with it? The Fit-on-the-Fly hip belt pads make it feel like the hiking backpack is hugging you and provides a superior custom fit like none other. They extend 5 inches to accommodate most hip sizes. A small but noticeable adjust Osprey has made to their backpacks compared to others is the fact that the sternum strap is actually a little lower. This is great news if you like to wear the sternum strap as it no longer rubs up against your collar bone. Plus for additional safety, just like most Osprey hiking backpacks, the sternum strap also comes with a built in whistle. The whole concept of the Osprey Atmos 65 AG is the anti-gravity suspension system and boy does it do a great job. The giant mesh panel on the back has two purposes. First, the ventilation is incredible as the whole back is made up of mesh; you never have to worry about back sweat. Secondly, it provides amazing carrying comfort and feels like a cloud floating on your back. You can easily pack 50 pounds onto this pack and not have any discomfort. Some may say the packs are a little heavy but sub 5 pounds doesn’t sound too bad to me. Everything about this backpack oozes with comfortability and is my go to hiking backpack at this point in time. It is some of the best money I’ve ever spent. The Osprey Atmos 65 AG easily gets 5 out of 5 stars for comfortability. I might as well not even bother writing about durability for an Osprey pack as everyone knows they are incredible both in regards to craftsmanship and to their commitment to their product. If you’re new to backpacking, hiking, traveling, whatever it may be; just know that Osprey is the company you want to work with if you have an issue with your backpack. First off the materials that Osprey uses are excellent and always are able to withstand abuse. This specific backpack has been dragged through water, over rocks and dealt with general wear and tear like a champ. A lot of times I thought I might have torn a hole in the pack only to see it was completely unaffected. The only area that you need to be careful with is getting any kind of mesh or something snagged and ripping. Luckily Osprey has us covered if this is the case. Osprey’s “All Mighty Guarantee” is the best thing in the business as it offers a lifetime warranty on any product you own from Osprey weather it was purchased when they first started in the 70s or you got it yesterday. They stand by their products and that’s commitment you don’t see every day from retailers. So if you didn’t know about their excellent guarantee, well now you do know! Osprey is obviously not new to this game and they know what hikers, backpackers, travelers want out of a backpack and they provide it one hundred percent. You won’t have to worry about the pack itself getting destroyed and any kind of issues you do have can easily be remedied with the use of their warranty. 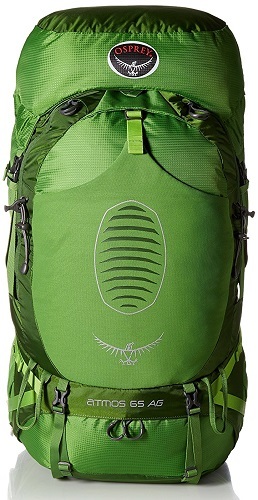 Osprey’s Atmos 65 AG easily gets 5 out of 5 stars for durability! Osprey backpacks are incredible pieces of engineering and they are usually loaded with great features and innovative ideas. This is true once again with the Atmos 65 AG. They took their standard Atmos 65 and upgraded it, making it arguably one of the best hiking backpacks available, period. One of the great features of the Osprey Atmos AG line is the storage and accessibility to your gear either with your backpack still on or on the ground. Perhaps one of my favorite innovations in hiking backpacks recently is the ability to access your contents from the front of the bag with panel loading. No longer do you need to reach down through the top of the bag and pull everything out first. The Atmos AG comes with this panel loading and also still allows access through the top of the pack if you still want it. One of the features that I liked is this idea of a floating top lid. 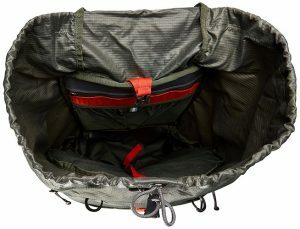 It’s capable of extending outward to allow you to pack even more and have larger loads or can even be completely removed from the pack altogether allowing the pack to be a bit more compact and lighter. In most situations when you’re hiking, you’re going to need fluids and lots of them. Most of the time this requires that you take your pack off to get to your water; however, with the Atmos AG you’re able to use an internal reservoir sleeve that’s located in the main body of the pack which is perfect for Camelbak or any other hydration pack. On top of that Osprey smartly designed the water bottle holster to be angled allowing you access without taking of the pack! Osprey’s exterior improvements don’t stop there, they also have their “Stow-on-the-Go” trekking pole attachment which is designed to allow you to quickly attach and carry poles, while wearing the pack, saving you time from having to take the pack off and taking away time from actually hiking! The Atmos also contains side compression and internal compression straps to help do two things. One keep your pack stable and compressed and the other to prevent any valuables from the inside getting thrown around. Speaking of straps the bottom of the pack has straps with lots of slack and is great for packing camping gear or sleeping bags. Finally to the Atmos 65 liter hiking backpack loves to keep its owners organized. The backpack comes with lots and lots of pockets for you neat freaks out there. There are five, yes five exterior zippered pockets and on the inside you get an additional three slip pockets. Now unfortunately not every pocket is going to be extremely useful. One small gripe we have with the hip belt pockets is that they are very tight or small. You’re able to maybe get in a couple protein bars into one pocket and about a camera or smart phone in the other hip belt pocket but not much else. Obviously as you can tell, Osprey has lots of things they do right with their backpacks and I’ve noticed they are always improving year after year, taking customer feedback seriously. The Osprey Atmos 65 AG has loads of features that keep you hiking and not wasting time having to stop for gear or drinks and we like that. 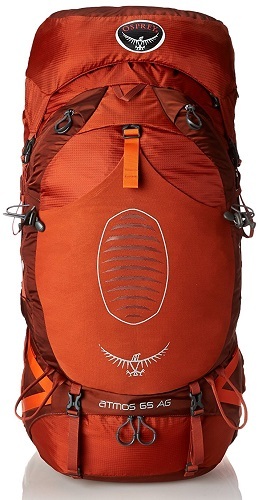 The Osprey Atmos 65 gets 5 out of 5 stars for functionality! The Osprey Atmos AG has been an incredible backpack to review and honestly just to use. It’s by far one of the best backpacks out there and if you’ve read through the review I’m sure you see a trend with how the ratings for each section are going. This backpack by Osprey has incredible lines, excellent comfortability, world famous lifetime warranty and amazing functionality, all at a cost that you would expect to pay for such greatness. It’s neither too expensive nor cheap but for lifetime guarantee, it’s just about the best money can buy. Before we give the overall rating, just to review we’ll recap what we found to be good and bad with the Atmos 65 AG. Osprey knows different people of different sizes will use their backpacks, therefore they offer the Atmos 65 AG in a small, medium and large version. The Anti-Gravity suspension system is extremely comfortable with a mesh backing that keeps the pack off your back and light and also ventilates to keep your back dry. The padded hip belts are so well made, it feels like the backpack is hugging you, plus they are adjustable. Osprey only uses the best materials available and the durability of the Atmos AG is incredible. The floating top lid is completely removable should you not want or need it or can be used to overload your backpack to bring with you even more gear. The Atmos AG offers panel loading access to get to your gear without having to go through the top and pull everything out first, although that’s still an option for you if you want it. Osprey built this with a built in hydration sleeve to allow you to pack a Camelbak or other hydration tube in your backpack. Talking about hydration, Osprey made sure to angle the water bottle attachment on the outside of the pack so that you can access it without having to take your pack off and just keep hiking. Stow-on-the-Go trekking pole attachment allows you to access your trekking poles while your hiking without having to take your backpack off. Interior and exterior compression straps keep your gear completely stabilized and secure so as not to damage anything internally. Five exterior pockets and three interior pockets provide you with lots of organization. The world famous “All Mighty Guarantee” is a lifetime warranty that Osprey provides on any of their products regardless if you bought it in the 70’s or today. There is a lack of external attachment points but again this pack can hold almost everything inside anyways plus, it’s not an external frame backpack. The hip belt pockets are very small and only able to hold a couple of snack bars and perhaps a smartphone. Osprey is a pack that you will come to love if you’re not familiar with it and if you are, then I’m sure you’re agreeing with me when I say they make incredible packs and this Atmos 65 AG is no exception. 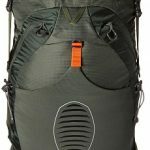 The cost of the backpack is in an average range of what you would expect to pay, not too much, not too little and taking that into consideration of everything else we’ve reviewed, the Osprey Atmos 65 AG gets a final rating of 4.5 out of 5 stars!